@Bob Matthews Yes it was shown in Cinerama, as well as standard 70mm format. It ran a week shy of two years here in LA. Cinerama Dome in Hollywood had a 50th year anniversary screening last May. 2001 is my all-time favorite film, period. It opened at a drive-in in Jacksonville and we never considered not seeing it. Still watch it once a year or so. 1968, quite a way before CGI. Was the original release in Cinerama? I saw it at a specific first-run Manhattan movie theater because it was advertised in super wide-screen only there on the East Coast. I think it was Cinerama but can't be sure if that was the widescreen process. I also have the original "Playbook" that I paid an extra dollar or two for which included a lot of technical information. It's around somewhere but good luck finding it. Was a science fiction fan in those days and so naturally loved the movie. It didn't drag for me at all. I too, felt it was a slow and tedious movie. Just as bad "Star Trek the Movie" when they spent all that time showing the visuals of Vger while they were being pulled in by the tracter beam. 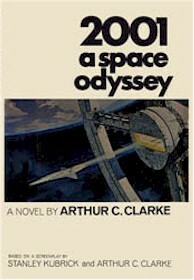 Didn't sit through 2001 until four days before 2010 came out in 1984. Man, was I thrilled and elated to learn Kubrick had nothing to do with the sequel! 2010 was great; 2001 was an ordeal that literally had no ending. Was an excellent read. Even the Mad Magazine version. Found the movie kind of slow. Remember standing in line for an hour to see this movie.